It’s amazing how almost every topic inspires passionate debate among cyclists. Kickstands are one of those Holy War topics with some arguing that they aren’t needed and others – like me – saying they don’t know how you can get along without them. This is what it looked like on my Trek 1220. I moved it over to my Surly Long Haul trucker when I bought it at the first of the year. The nice thing about this kickstand is that it will raise either the front or rear wheel off the ground, which means it can act as a portable work stand. Taking a wheel off to fix a flat or making brake or shifting adjustment is a piece of cake. Some folks have had problems with this style kickstand either crushing the chain stays or working loose. I haven’t had that happen on either of my bikes. Maybe that just says that I’m weaker than some cyclists and stronger than others. The long legs WILL dig into soft blacktop or soil and cause the bike to spill over. A strong wind will also dump it. In fairness, I can’t think of any time when my bike has fallen over when it wouldn’t have fallen over easier and earlier with a conventional kickstand. 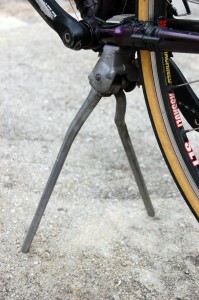 Most kickstands attach to the bicycle. The Click-Stand takes a completely different approach. Think of a folding tent pole that deploys with the flick of your wrist and supports the bike from the top tube. It probably weighs about as much or less than a regular kickstand. Even my weight wienie brother Mark was willing to try one. Watch this demo that my four-year-old grandson did minutes after I handed it to him. You flick out the Click-Stand (WOW! ), place the rubberized cradle under the top tube just in front of the seat tube, lean your bike over slightly and place the rubberized bottom end about 10 inches off the centerline of the bike. 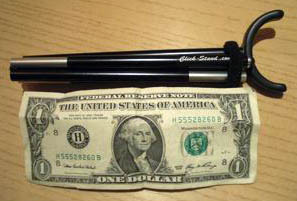 Your two wheels and the Click-Stand have become a tripod. I was impressed. It doesn’t deploy as quickly as my double-legged kickstand, but it’s much more stable. My bike hasn’t taken a spill since I started using it. Shortly after I got mine, the inventor came up with some nifty ways to mount it on your bike. If you go to my link above, you can see how I carry it on my LHT. Bro Mark just stuffs his in his jersey pocket. If you’re a Freakbiker riding a tall bike, you make your own manly variation of a Click-Stand out of an old IV stand. Consider yourself lucky that your city is pnioidvrg racks free to businesses. Here in Dead Moines, er, Des Moines, the city is now catching on to this and pnioidvrg parking meters with the circles to lock up bikes (not as cool as the one pictured with the bike, but same general shape) . One entertainment/shopping district is solely responsible for the majority of the bike lanes in DM because they put pressure on the city to build them. Never underestimate the power of locally owned businesses on local government. Tell your favorite businesses that bike racks=more customers and they watch them get the bike racks installed.On a unrelated side note: I just purchased a used Freeradical kit today! Can’t wait to get her installed on my rig. Thanks so much…while prowling the internet searching for a kickstand for my ebike ( it has a square chainstay and is over 100lbs fully loaded) I ended up getting the click stand and it is AWESOME! I will be sending pics to the company website later on today and it has been a god send! Thanks for the info! Glad you found the info useful. I don’t use my Click-Stand EVERY time I stop, but I like it when it’s windy.